Electronic cigarettes are widely promoted and used to help smokers quit traditional cigarettes, but a new analysis from UC San Francisco found that adult smokers who use e-cigarettes are actually 28 percent less likely to stop smoking cigarettes. The study — a systematic review and meta-analysis of published data — is the largest to quantify whether e-cigarettes assist smokers in quitting cigarettes. The findings will be published online January 14 in The Lancet Respiratory Medicine. “As currently being used, e-cigarettes are associated with significantly less quitting among smokers,” concluded first author Sara Kalkhoran, MD who was a clinical fellow at the UCSF School of Medicine when the research was conducted. She is now at Massachusetts General Hospital and Harvard Medical School. “E-cigarettes should not be recommended as effective smoking cessation aids until there is evidence that, as promoted and used, they assist smoking cessation,” Kalkhoran wrote. 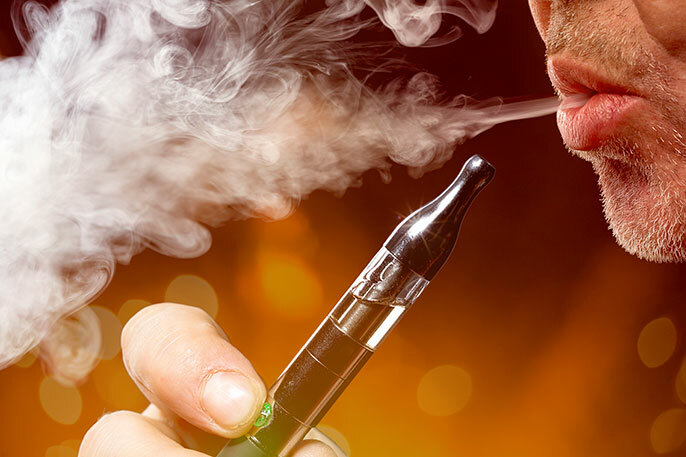 Electronic cigarettes, known by a variety of names including vapor pens, are battery-powered devices that heat nicotine and flavorings to deliver an aerosol inhaled by the user. While they are promoted as a way to quit traditional cigarettes, they also are promoted as a way to get nicotine in environments where traditional cigarettes are prohibited, even though more than 430 cities and several states ban their use in smoke free sites where conventional cigarettes are also prohibited. In 2015, the U.S. Preventive Services Task Force concluded that there was insufficient evidence to recommend the devices to help adults quit smoking. No e-cigarette company has submitted an application to the U.S. Food and Drug Administration to approve e-cigarettes for smoking cession, and the FDA has not taken any action against companies that claim e-cigarettes are effective for quitting smoking. In their analysis, the UCSF team reviewed 38 studies assessing the association between e-cigarette use and cigarette cessation among adult smokers. They then combined the results of the 20 studies that had control groups of smokers not using e-cigarettes in a meta-analysis that concluded that the odds of quitting smoking were 28 percent lower in smokers who used e-cigarettes compared to those who did not. There were no language restrictions imposed on the studies, which included both real-world observational as well as clinical studies. The studies included smokers who both were and were not interested in quitting, and included people as young as 15 years old. The studies included in the analysis controlled for many variables, including demographics, past attempts to quit, and level of nicotine dependence. "The overall effect is less, not more, quitting"
“The fact that they are freely available consumer products could be important,” Glantz added. Kalkhoran’s research was supported by the National Institutes of Health National Research Service Award T32HP19025. Glantz’s work in the project was supported by grant 1P50CA180890 from the National Cancer Institute and the FDA Center for Tobacco Products.